Over many years the main pass-time of the keepers was beachcombing and they never knew what would come ashore next. There were large quantities of new wood, which had been lost overboard from the deck cargo of freighters in rough weather. After a gale from a certain direction, large amounts of coal would be washed ashore and with this coal would come pieces of amber. This semiprecious stone was much sought after, as indeed it is today, but being deposited on a shingle beach, it proves to be very difficult to find until "amber-eye" is developed when it is then easy to spot. 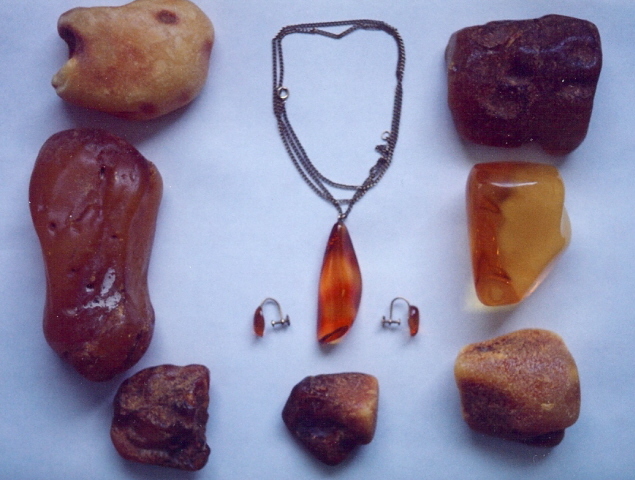 Amber is a fossilised resin from a species of pine known as Pinus Succinifera. They grew with other species of trees in the early Eocene period of the Tertiary Formation about fifty million years ago, so that any piece of amber found today is millions of years old. When found on the beach it is in a very rough state, but when it is polished it can be made into jewellery pieces of very great beauty. Some pieces, after polishing, are found to contain an insect or piece of flora which have been entrapped in the resin millions of years ago. One of the most historical finds made on the beach at Orford Ness happened in 1913 when some Swedish Platemoney was discovered. There were three pieces in all and one of them, which is now owned by Mr H.G. Rope of Orford, measures 8.75 inches by 9.75 inches and is just under 0.25 inches thick. It weighs 4lb 3ozs and is stamped with the year 1711 and 2 Daler Solffmynt, which meant it was worth 2 Dalers in silver money. Another one found at the same time is owned by the Orford Town Trust and weighs 2lb 13ozs, it is dated 1716 and the denomination is also 2 Daler Solffmynt. The third one was in the possession of the late Major Stewart Gratton and was thought to be a 1 Daler piece, it was sold in approximately 1977 to Messrs Spinks, the coin dealers and cannot now be traced. In January 1983, after the shore had been scoured by a North-Easterly gale, another Swedish copper coin was found by Mr Terry Stannard of Sudbourne. This was a circular coin, 45mm in diameter and weighed 1.5ozs. Its value was 3 Ore Swedish copper and it was dated 1669. It is assumed that this coin was from the same wreck as the other Platemoney, which was thought to have occurred some time around 1716 when large amounts of copper Platemoney was being brought to England from Sweden to be melted down. As described in the published copy of "The Great Light", the lights at Orford Ness were not very efficient at that time, hence the number of wrecks that occurred. In times of war, other articles were washed ashore when ships were sunk by enemy action. In the vicinity of the Lighthouse, wooden boxes containing butter were picked up on the beach during the 1939-45 war. After a German mine had sank a Japanese Freighter early in that war, thousands of pencils were scattered along the beach. After a particularly stormy night during the war, Archie Steel, who had been on night duty at the Marine Radio Beacon, walked across to the beach. With his head bent against the strong wind, he saw the Auxiliary Coast guard, Victor Brinkley, waving to him from the Coast guard lookout. So, he casually waved back. When he arrived at the top of the beach he realised that the coast guard had been waving him away for his own safety. Along the beach for hundreds of yards were a string of sea mines, bouncing about in the breakers. They had broken adrift during the gales and by some miracle were not exploding. Needless to say, Archie beat a hasty retreat from the beach. When another local inhabitant, the late Peter Goldsmith, was beachcombing in 1953 about half a mile South West of the Lighthouse, he found a carving of a lion. It was about 15 inches long and 10 inches high and had been crudely painted green and red. After it had dried out and the paint had peeled off, it was found to be made of mahogany. The back of the head had a squared section, which could have housed a container of some sort. Inquiries were made at the Ipswich, British and Maritime Museums but all were unable to identify it, but thought it might be of Eastern origin. A relative of Peter said it was similar to carvings he had seen placed alongside roads in China with joss sticks in a container in the squared off piece of the head. He thought it may have been used for some kind of religious ceremony.